Last week, Chrissy and I were invited to give our presentation from ASB Unplugged, Hardware is Not Enough: The Teacher-Facilitator Partnership, to our Headmaster, Dr. Bill Gerritz, and Deputy Headmaster, Andy Davies. Bill and Andy had heard a brief overview when we reported back about the conference, and wanted to get a deeper understanding of how Chrissy and I see the relationship between teachers and technology facilitators. Our presentation went over well, and Bill asked us to put together an article for the TIE Newspaper. For many years technology was treated as a discrete subject to be taught by a technology teacher. Classroom teachers, administrators, and parents expected that students would learn any and all relevant technology skills (usually related to word processing) in those classes. However, over the past decade or so, technology has moved out of the computer lab and into the classroom as a more fundamental tool for demonstrating student creativity and understanding. Now the expectation is that classroom teachers will authentically and appropriately embed technology into the learning experience. In an ideal world, this integration would happen seamlessly, but the fact is that due to the rapid pace of change with technology, teachers' varying comfort levels with technology, frequent turnover in international schools, and classroom teachers' already extensive list of responsibilities, the majority of teachers could benefit from the support of a technology facilitator or coach. Bringing together the pedagogical expertise of the classroom teacher and the technological understanding of the coach not only provides consistent embedded professional development, but also makes the most of the extensive resources most international schools have to offer in a way that effectively meets the needs of today's students. The most important (and most obvious) reason for the facilitator and teacher to collaborate is to improve student learning. Collaboration allows the two teachers to combine strengths, share responsibilities, and learn from each other, bringing the best of both their experiences together to create an improved student learning environment. When co-planning, both content and technology standards can easily be combined thanks to each partner's specific focus. Other advantages of co-planning include the sparks of innovation that begin to fly when more than one teacher contributes their perspective to a unit or lesson, and the opportunity this allows to customize the pedagogical and technology experiences for that particular class or grade level. Successful collaboration with one classroom teacher begins to create a ripple effect among other teachers at the grade level or division - allowing other teachers to see how one of their colleagues has utilized technology effectively in their classroom. By sharing the results of quality collaboration more teachers may become interested, spreading the effects far and wide throughout the school, helping move the entire school community forward. Consistent collaboration with individual teachers or teams becomes naturally embedded professional development, developing 21st century skills for all teachers in their regular teaching environment. Finally, collaboration encourages the breakdown of classroom walls - whether at the grade level, division, school, or the global level - through the use of new forms of communication which creates closer ties with the school community, through the development of authentic audiences on a global scale, and through the connections made possible with technology. Breaking down classroom walls is the first step to truly embracing a 21st century learning environment. How to Collaborate Technology facilitation and collaboration, like technology itself, is anything but static. There is not one solution for all schools and all teachers that works all of the time. I have found it most useful to think of collaboration as a cycle that teachers enter and exit based on their individual needs. There is no beginning or end to this cycle, only differing levels of support. Position on the continuum isn't necessarily the same for all situations - the same teacher could be at different stages for different projects, simply based on his/her experience with the varying tools being used. 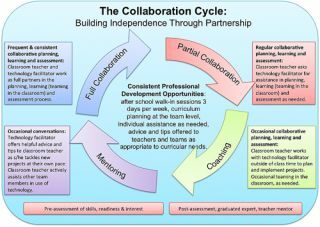 Full Collaboration: During this stage of the cycle it's hard to say where the teacher's responsibilities end and the facilitator's begin. They work together as full partners, co-planning, co-teaching, and co-assessing to develop an authentic, technology-rich learning experience for the students. This level of collaboration doesn't necessarily indicate that a teacher is a novice with technology in general, but rather that they would benefit from the partnership of another colleague throughout the process of planning, teaching and assessing. However, full collaboration is fantastic for teachers that are new to technology and appreciate the feeling of support throughout the process. Full collaboration continues as long as the teacher and facilitator feel the support is necessary. Partial Collaboration: During this stage of the cycle, the teacher is feeling more confident with the tools being used in the classroom and requests assistance when necessary. Often the focus is on co-planning an entire unit, and co-teaching for specific lessons within that unit. Partial collaboration is a great way to build teacher confidence, while also modeling effective use of technology in the classroom. Partial collaboration is often useful when the teacher is comfortable with most aspects of a certain technology tool or unit of inquiry, but needs specific help in certain areas. Coaching: During this stage of the cycle, the facilitator takes more of a "backstage" approach, supporting the teacher mostly outside of class time on co-planning or brainstorming ideas for projects or lessons. Usually, this is when a teacher is comfortable planning and teaching a unit, but may need some advice or guidance on how to best approach the unit, or in-class support on occasion. Coaching works well when the classroom teacher feels confident about what they're doing but appreciates some collaborative brainstorming or problem solving. Mentoring: During this stage of the cycle, the teacher is almost entirely independent in their own classroom, and working towards helping other teachers effectively utilize technology in their classrooms. S/he may still work with the facilitator for advice, but is being increasingly looked upon as an expert by their peers. This is where the cycle begins to create a sustainable model for professional development, because now the facilitator is not the only source of educational technology support within the school. Many schools utilize coaches, facilitators or coordinators, but often the specifics of who actually does what in the collaborative relationship are not fully defined. It's especially useful to clarify the specific roles and responsibilities of both the teacher and facilitator in this partnership for several reasons: first, the role of the technology facilitator is always changing as the technology changes; second, teachers and administrators often have a preconceived notion of what the "tech person" does which doesn't match the reality; and third, for teachers to even want to work with a facilitator, they need to know what they can expect. Too often the discussions about technology in schools are driven by finances and the technology itself. The advantage to the collaborative approach to technology integration is that it's not focused on hardware, but rather on teaching and learning. It's flexible enough to be used in large schools or small schools, with varying levels of technological infrastructure, and can also be combined well with schools that are also offering discrete technology courses. No matter what the situation, it is recommended that the facilitator to student ratio does not go above 1:300. The success of the collaborative model is always enhanced by ensuring that there is enough time to support all students and teachers. Once a school begins to build this culture of collaboration, it soon becomes second nature for teachers to work in partnership with the technology facilitator, bringing new and innovative ideas into the classroom, learning new ways to meet the needs of all students, and exploring the possibilities to connect, communicate and create on a global scale. This collaborative partnership is a powerful tool to increase student learning by combining the expertise of multiple educators. Opening the doors to individual classrooms is the first step towards transformative use of technology and embracing the changes that technology is bringing to our world.